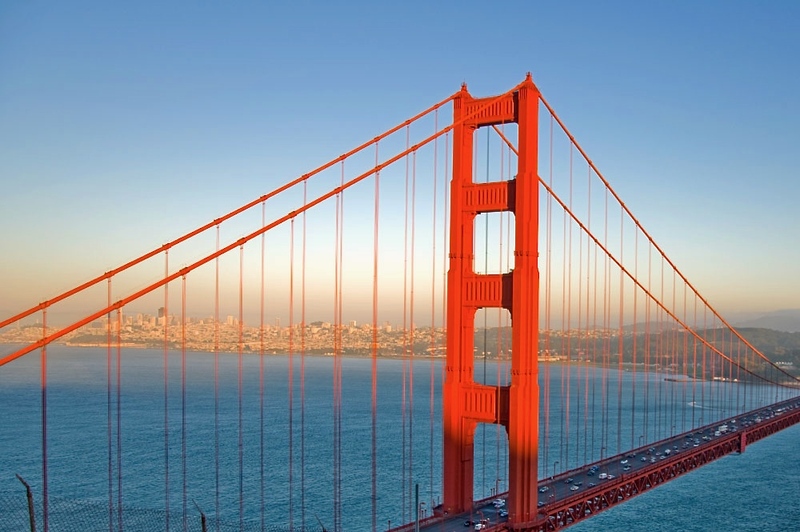 Home > San Francisco Travel Tips > 6 Best Views in S.F. The 6 Best Views in S.F. Alamo Square is the famous lookout shown in most ads of San Francisco. The Painted Ladies—beautiful Victorian houses, which is also known as Postcard Row (gee, we wonder why)—is the focal point of the park. You can bring a friend, a blanket and a bottle of wine and enjoy an afternoon in the park. 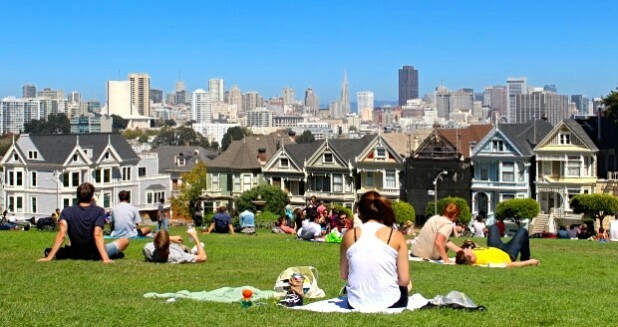 Alamo Square is a popular viewpoint and easily accessed by public transportation. And when you visit the park, make sure your camera is charged. Afternoon is the best time to see Alamo Square. The sun shines on the Painted Ladies and makes your photos look awesome. You can skip the morning here. Twin Peaks is a classic view of the city. The second highest elevated point in San Francisco, Twin Peaks (on a clear day) provides a view of the Golden Gate Bridge, the Financial District and Market Street, a lifeline road of the city. At night, S.F. sparkles to life from atop Twin Peaks. Because of the elevated location, though, remember to dress warmly. The fog chill can turn you into a snowman quickly. The walk to the top of Twin Peaks might be somewhat strenuous, but when you reach the top it’s worth it. On a clear day (more often than not, later in the afternoon), the city comes to life from the top. Dolores Park is the hip park of San Francisco. Under construction until 2015, only half of the park is available to people currently. But it’s still a good view. You can relax, party or dance with sights of the San Francisco Financial District in the distance. Look for the Truffle man in Dolores Park. He carries a small assortment of flowerpot-type bowls and knows how to party. But make sure your day is clear before you partake in his edibles. 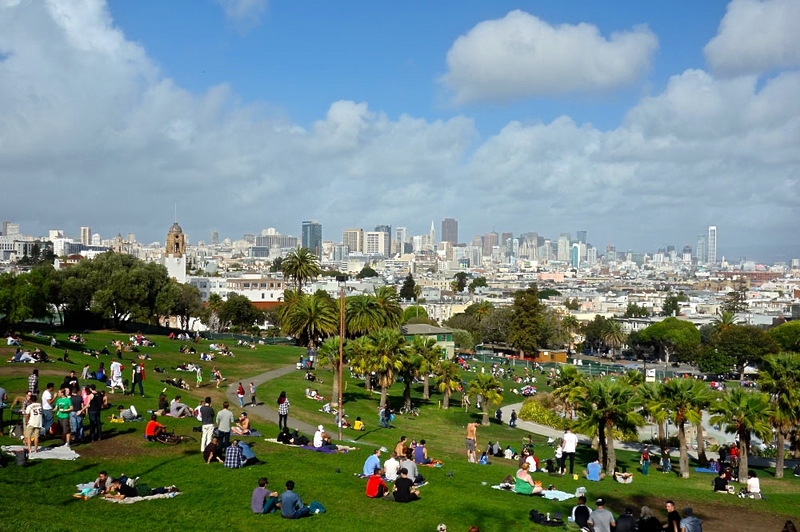 Dolores Park is a place for a six-pack, some friends and people watching. The Mission has some of the best weather in the city, too. Bring some sunscreen and a good attitude and you’ll no doubt have fun. Coit Tower, to put it visually, is the large fire hose in the sky. From the top, which is one of the tallest points in San Francisco, you can see the Financial District, The Embarcadero and Fisherman’s Wharf, as well as other neighborhoods of the city. 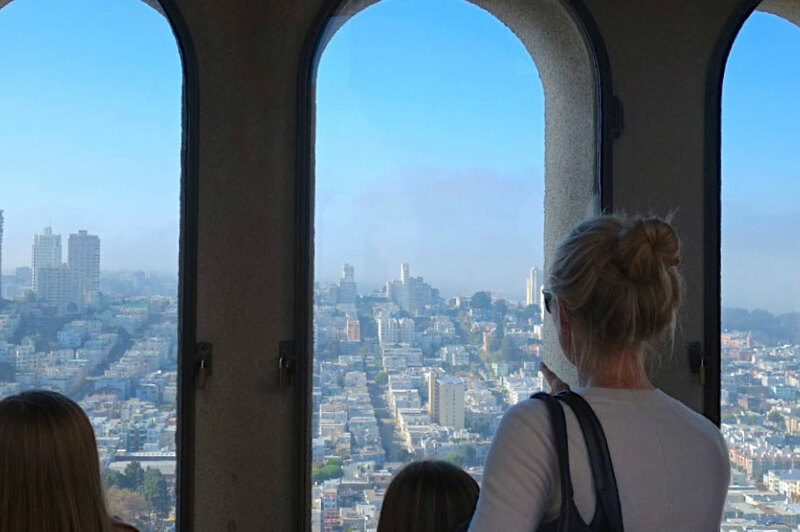 Unfortunately, though, if you want to visit the lookout in Coit Tower (a full 360-degree view of the Bay as you stand in one spot, at the top of the tower), the cost is $8. The best way to reach Coit Tower is to walk the Filbert Steps from North Beach (near Washington Square). You can listen for bird screeches in the bushes, too, because it might be the Wild Parrots of Telegraph Hill, another treasure of San Francisco. Coit Tower is good for a morning or afternoon adventure. Alcatraz and Angel Island are both in the bay of San Francisco. The advantage to these views is you can ride a boat to get there. And as you float, the sights of San Francisco change to give your photos more variety. Alcatraz offers the prison tour, but you should no doubt stop on your tour to take in the views of San Francisco. The sights alone can make your ticket worth the price. From Angel Island, you can see Marin County. The views of Tiburon and Sausalito open up and give you an appreciation of the San Francisco Bay. And from Angel Island, the peace of the Bay is much more appreciated. One of the more popular lookouts of San Francisco, the Marin Headlands is THE San Francisco viewpoint to see. Most of the photos from here include the Golden Gate Bridge, the Bay, the city of San Francisco or a combination of the three. You can even see Alcatraz and Angel Island in the distance. While the Marin Headlands offers a fantastic view of San Francisco, unless you know karate, it’s tough to find a parking space. Most people miss the Marin Headlands view. Maybe they’re too lazy to climb the hill, or they just don’t know of the lookout. But you should not fall victim to this trap. Instead, the Marin Headlands is a MUST SEE view for EVERYONE in San Francisco—we’re talking bucket list caliber. And there you have it: a compiled list of some of San Francisco’s better views. 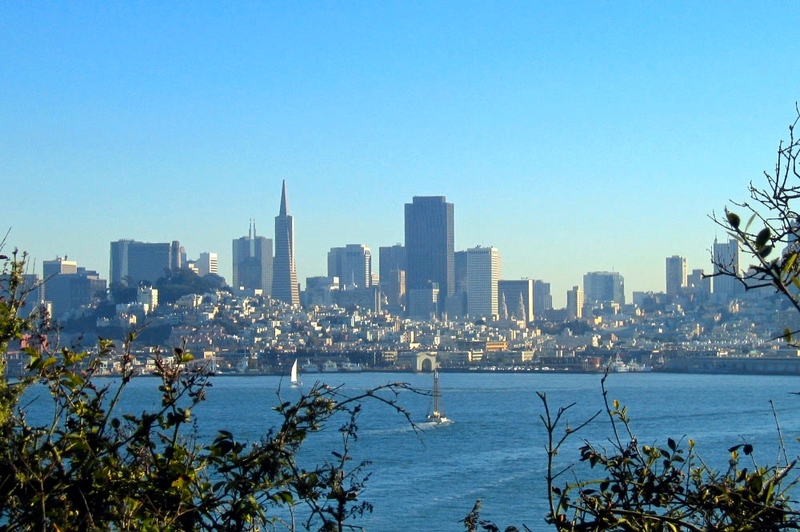 Location of the Best Views in S.F. For the most part, these are lookouts. But the city is filled with views from all different angles, everywhere. Even a few secret spots exist in the city. But the only way to find them is to start exploring. Charge your camera and start hiking.